Many were also besieged by protesters parading with photos of mutilated animals and screaming “Puppy killer!” through megaphones at all hours outside their homes. One woman said she received an e-mail threatening to cut her 7-year-old son open and stuff him with poison. A man said he was showered with glass as people smashed all the windows of his home and overturned his wife’s car. Today a mysterious full-page ad in The New York Times attacked The New York Stock Exchange for backing out of its agreement to list Life Sciences’ shares on September 7, 2005. The New York Stock Exchange backed out of its agreement to list Life Sciences’ shares on September 7, only minutes before the opening bell. Exchange officials never provided a reason for the postponement, but people involved with the listing were harassed by animal rights activists trying to derail the research company’s plan to trade on the NYSE. The company, which does federally-mandated animal research for the pharmaceutical and biotechnology sectors, saw its shares plummet following the postponement and it was later forced to trade shares on the Pink Sheets, an over-the-counter market for stocks that do not to meet minimum listing requirements, or file with securities regulators. It has since stopped trading on the Pink Sheets as well. Animal rights group Stop Huntingdon Animal Cruelty (SHAC) has pledged to keep up the pressure until the company — parent of British-based Huntingdon Life Sciences, which has long been a target of U.K. animal rights activists — is shut down altogether. 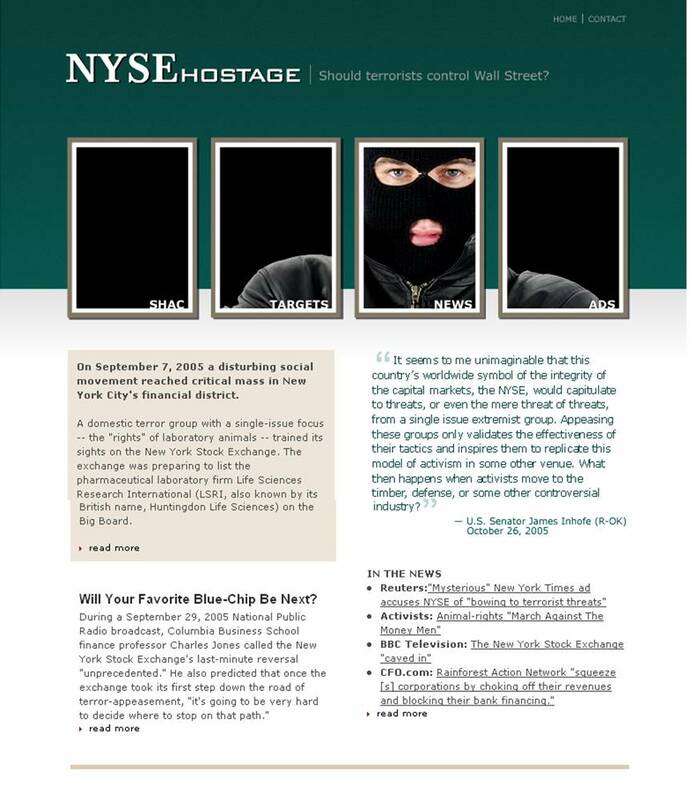 A spokesman for the NYSE Group Inc, would not comment on the ad. 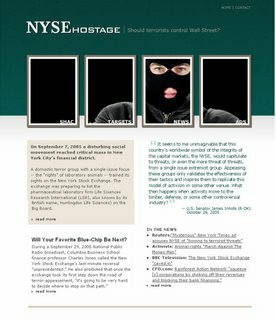 Richard Michaelson, Life Sciences’ chief financial officer, said he “has absolutely no idea” who is behind the ad and the Web site address (www.nysehostage.com) that appears at the bottom of the page. Neander News has more on the terrorist group SHAC. American Left Uses New Method to Terrorize… Target Children!